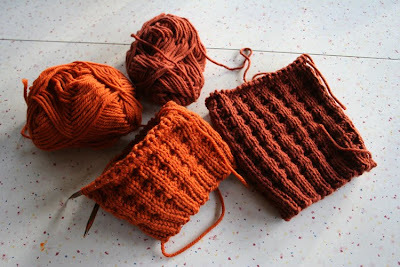 I have quite a bit of knitting to share this week. Between 3-4 hours in the car on Saturday and staying home all day Sunday and Monday, the projects just seemed to fly together. Elizabeth's birthday sweater came off the needles and looked just lovely on her, if I do say so myself. She was in a silly mood when I had her try it on (and she would only try it on the ONE time since she doesn't want to wear it at all until her birthday) so the pictures reflect the goofy poses she wouldn't stop making. I also managed to quickly finish my first installment in the One-For-Me ravelry group that Hillary started. I procured this lovely yarn, Araucania Azapa in dusty rose (this photo doesn't remotely do it justice, in either softness or color), at the amazing yarn shop we found in Asheville. The pattern is Robin's Egg Blue Hat, and with the addition of the right button, which I finally found on etsy (from a relatively local etsian, no less! 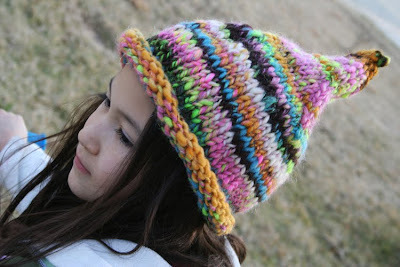 ), I'm hoping it will become my new favorite hat! Hopefully I'll be able to post another photo when it's complete and warming my head. As for that funky yarn, which was purchased months ago from Ozknits on etsy, Elizabeth requested an Elf Cap from Handknit Holidays as her "party elf cap" to wear on her birthday. I don't generally solicit help on their birthday presents, but I've made her so many hats that I thought she might want to pick the pattern for this hat. 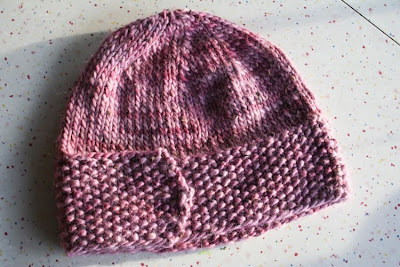 I love this quick knit of a hat. I think it took less than 3 hours total. 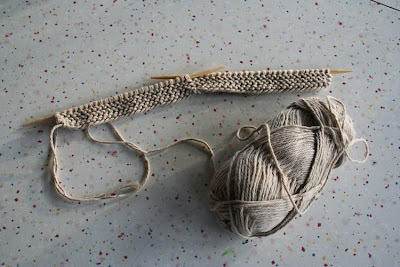 I also just started this baby sweater for my cousin's new little one, due in late March. Knitting with yarn also purchased in Asheville, this organic cotton from Mirasol's Samp'a line is so delicate and beautiful. I'm hoping it makes a lovely baby sweater. This project is bittersweet for me as I'm knitting a sweater out of Natural Knits for Babies and Moms, which I bought when Finn was a baby intending to make something for him out of the book. Of course, I didn't know how to knit at all when I bought the book and learning a new skill with a newborn around isn't exactly an easy feat, so the book sat. I know I'll get plenty of use out of this book though, and I'll pour all the knitting-love into them that I couldn't pour into Finn's baby sweaters. And waiting in the wings, because there's always something waiting in the wings, right?, this beautifully soft baby alpaca/silk blend from Knit Picks which will hopefully be my first cable and my first mittens all in the same package! We shall see how that goes! Everything looks lovely as always! Wow you have been knitting a lot lately! 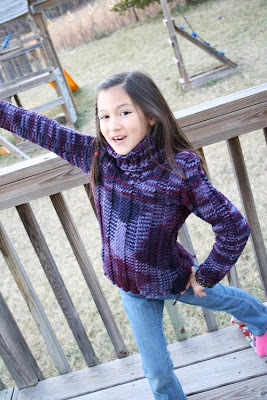 Tell Elizabeth her sweater modeling is perfect! Those colors are gorgeous too. And I LOVE the funky party hat! 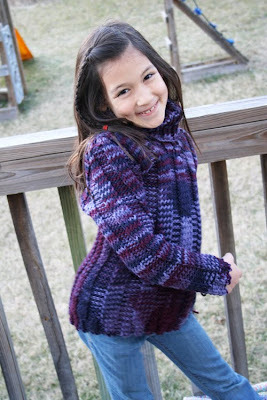 I believe you are now officially what they call "a kniting fool" This is great work, Joy! Joy these are all amazing projects!!! wow, that's a lot of knitting. 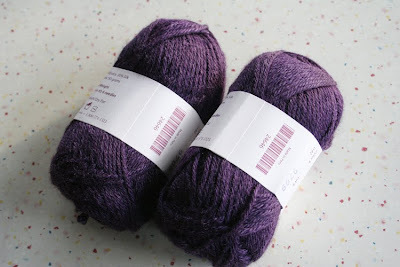 isn't knitpicks great. 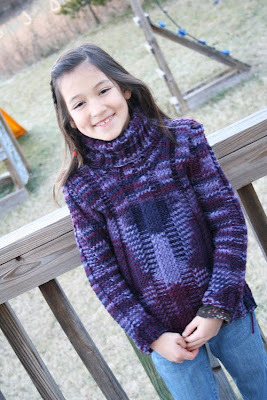 wonderful purple sweater - i love the colourway of that yarn. Wow, I just love that sweater! The colors are gorgeous! And the hats are great also!! Love the "One for Me" idea! That sweater is absolutely beautiful! Well, every project is beautiful! I hope your Wednesday has been wonderful! oooooh, I lovelovelove that hat! Just beautiful!! The sweater looks so great! It suits her perfectly! What a lucky girl!